Incredible family and team tour visiting Munich, Prague, Salzburg and Vienna. Austria, Czech Republic, and Germany all in one tour. Cost for 2019 tour is per person for the land package. Deposits due before May 30, 2019. Those joining in the fall will have payments in October and November. Everyone coordinates their own flights. We will have several flight options that families may choose from so we can coordinate arrival transportation. We fly into MUNICH (MUC) Airport. 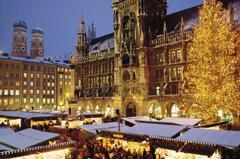 Book your incoming flight so you arrive in Munich on Dec. 27th between 7 AM and 10 AM. Bus departs for Hotel at 10 AM. Depart Prague on January 3rd any time after 11 AM. Families have the option to help raise funds for their tour through selling sponsorship on the tour jerseys. 90% goes back to the player to use for their fees. Average player raises $900.00 with just one sale. Souvenir jersey with sponsors for each player. Processing charges applicable when using credit cards. All options based on $600.00 online deposit and balance due on November 1, 2019. Incoming freshman have until June 15th. IF a player or family gets a sponsorship or sells advertisement then that amount is deducted from the last payment. A full reconciliation of your bill is done on November 5th. Anyone that is over paid will receive a check by November 20th or until the funds have cleared from your sponsor. We will offer one group flight option. More details coming.